This paper examines the South African economic sector's electricity consumption in response to fluctuations in electricity prices and economic output for the period 1993 to 2006. The results of the panel data analysis show that the industrial sector was the only one with statistically significant price elasticity over the study period. Further, economic output was a positive contributing factor to the industrial and commercial sectors (having high and significant coefficients). This is in contrast with the other three sectors, agriculture, transport and mining, whose electricity consumption was affected neither by price nor by their production. This anomaly is the result of both the relatively low and declining (in real terms) electricity prices over the study period, and the fact that the proportion of electricity cost to total cost is relatively small for the majority of sectors. There was therefore no major incentive to reduce electricity consumption and/or to be efficient. While these results explain, at least in part, the historical increases in electricity consumption, they may not hold for the period since 2008 (for which adequate data is not yet available), given the sharp increases in electricity prices recently experienced by the country. Electricity is a low-valued yet necessary good within any economy and is one of the pillars of economic growth (Blignaut, 2009). The generation, supply and distribution of electricity, and access to it, have the potential to unlock economic development. South Africa, with almost 50 million residents, has about 39 000MW of installed electricity capacity. In comparison, Nigeria has an installed capacity of 4 000MW serving 150 million. This comparison indicates a key reason why South Africa could develop in the way it has, while Nigeria, despite its natural resources, climate and arable land, has not. During the years 2007/08, South Africa experienced periods when there was a severe lack of electricity supply, which led to continual blackouts and load-shedding as a result of the problematic situation in the generation and reticulation of electricity. Eskom, the state-owned electricity supplier for the country, has often argued that the solution would be the expansion of the current network of power plants. Recently (from 2008 onwards), Eskom embarked on a price restructuring process that implied sharp increases in the price of electricity across all sectors. These increases were admittedly from a low base, but they have been given a high profile in the media and among various decision-makers and large users of electricity. Given these recent developments, there is no adequate dataset to capture both the price and the electricity usage data to reflect any possible behavioural change. The question is, however, whether price played a role in determining historical electricity consumption. This paper seeks to answer this question by examining the price elasticity of various economic sectors in South Africa for the period before the price reform. This was done by employing panel data analysis for the period 1993-2006. The results will in all likelihood indicate whether the sectors' behavioural responses have played an important role in the current mismatch between the demand for and supply of electricity. The remainder of this paper is structured as follows: the next section presents a brief review of literature dealing with electricity demand and its determinants. The subsequent section describes the situation of the electricity market in South Africa. Next, the research method and data used are presented, while the empirical results are discussed after that. Finally, the conclusions and policy implications of the findings are discussed. Energy studies have attracted international attention during the last decades owing to their relatedness to global environmental problems and the relationship between energy and various countries' growth and development trajectories. More specifically, the investigation of the demand-response sensitivity in the electricity sector on both the aggregate and industrial levels has drawn increasing interest as far as analysing the trend of electricity consumption on an aggregate and industrial level goes. A number of studies for both developed and developing countries have focused their investigations on the demand for energy or, more specifically, for electricity (Amarawickrama & Hunt, 2008; Atakhanova & Howie, 2007; Hondroyiannis, 2004; Dergiades & Tsoulfidis, 2008; Diabi, 1998; Alfaris, 2002; Narayan et al., 2007). The demand for any good or service is typically affected by its own price, the income of the buyers, the price of the substitutes and other variables based on the type of the good. Although the methodologies followed in these studies differ, the majority concentrated on income (or production/output) and electricity price as the main variables to explain electricity demand. De Vita et al. (2006) estimated the long-run elasticities of the energy demand for three types of energy, that is, electricity petrol and diesel, in Namibia for the period 1980-2002. They estimated the aggregate energy consumption as a function of Gross Domestic Product (GDP) and the price of energy. Depending on the type of energy in question, they also test for the importance of other variables, such as air temperature, the HIV/AIDS incidence rate and the price of some alternative forms of energy. Their results showed that energy demand is affected positively by the changes in GDP and negatively by the changes in the energy price and air temperature. Special attention has also been paid to developing economies. Ghaderi et al. 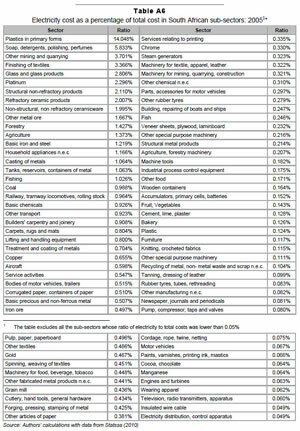 (2006), for instance, investigated the electricity demand function of the industrial sector in Iran. A similar sectoral analysis of Russian industries was conducted by Egorova and Volchkova (2004), who found that the electricity prices were a factor of energy consumption, although other factors, such as the output of the industries, proved more significant. Studies were also carried out for developed countries by, for example, Lundberg (2009), who derived a demand function of Swedish industrial electricity use as well as the changes in demand trends over time. By dividing the sample into two periods (19601992 and 1993-2002), he showed in his findings that output was a more significant factor in the first period, while price became more significant in the second. A possible explanation for this change was the more efficient use of energy in the latter period. In Romania, electricity consumption is also considered significantly important for the development of the country (Bianco et al., 2010). In their study, Bianco et al. (2010) modelled non-residential electricity consumption as a function of GDP, non-residential electricity price and the non-residential electricity consumption of the previous period. First, they estimated the GDP and price elasticities for the non-residential electricity consumption for the period 1975-2008, identifying them as the main determinants of the consumption's evolution. They then proceeded with a forecasting exercise. Their findings show that price elasticities varied between -0.075 in the short-run to -0.274 in the long-run, while the income elasticities were between 0.136 in the short-run and 0.496 in the long-run. In a panel data framework, Narayan et al. (2007) examined the residential electricity demand and its determinants for the G7 countries. The electricity consumption is determined as a function of its price and real income per capita. They proposed two models that differ only in the treatment of the prices. The one model includes real electricity prices while the other includes electricity prices relative to gas prices. The main result reported is that residential demand for electricity is income inelastic but price elastic in the longrun. Regarding the industrial electricity consumption, Dilaver and Hunt (2010) examined the relationship between industrial electricity consumption, industrial value added and electricity prices relating to the Turkish industrial sector for the period 1960-2008. They concluded that output and real electricity prices are the significant factors for the determination of electricity consumption (price elasticity= -0.16 and income elasticity = 0.15). Locally, Blignaut and de Wet (2001) examined the industrial electricity consumption with regard to the price by estimating the price elasticities for the various sectors between 1976 and 1996. They found weak relationships between electricity price and consumption, some of which were positive. Ziramba (2008) analysed residential electricity demand, showing that price did not have a significant impact on the residential sector for the period 1978-2005. Instead, income was an important determinant of electricity demand. However, these results were challenged by Inglesi (2010), who showed that, for 19802005, price was a significant factor in total electricity demand, but at an aggregate or economy-wide level. Given the conflicting evidence, this paper attempts to expand the work done by Blignaut and de Wet (2001) and Inglesi (2010) and to examine the price sensitivity of the electricity consumption for a group of economic sectors separately. The South African electricity sector has been characterised over the years by unique traits, while it has passed through different phases in which various key players had dissimilar responsibilities. Here, the main phases as well as the key players and their roles in each are analysed. The following sections discuss the evolution of South African electricity consumption and prices. According to Marquard (2006), the South African electricity system experienced three main phases. Phase one, the late 19th century to the 1900s, was characterised by the existence of small electricity systems set up by local authorities in cities and relatively larger electricity systems that were self-producers (mainly mines). Phase two, the late 1900s up to the early 1920s, started with the development of a generation monopoly in the Witwatersrand for the provision of electricity to the gold-mining industry. The third phase, from the early 1920s until today, started with the establishment of the state utility, Eskom, and saw the transition towards an integrated national system with Eskom as the generator, transmitter and main distributor of electricity (Marquard, 2006). The domestic electricity supply and regional trade statistics are provided in Table 1. Electricity generation increased slightly (approx. 4%) during the study period. However, the current maximum generation capacity has a ceiling, as can be noted from the year 2000/2006, which saw no capacity expansion. This makes it unfeasible for the policy-makers to increase the supply substantially in the short-run. The country's economic growth and industrialisation, as well as the electrification programme, resulted in high levels of demand for electricity. This, in combination with the limited supply, led to countrywide power outages that had significant negative effects on the economy as a whole. As the national electricity supplier, Eskom was responsible for managing the situation, focusing on demandside management (DSM) and the energy efficiency programme in the short term, as well as planning to maintain and expand the current infrastructure in the long term. 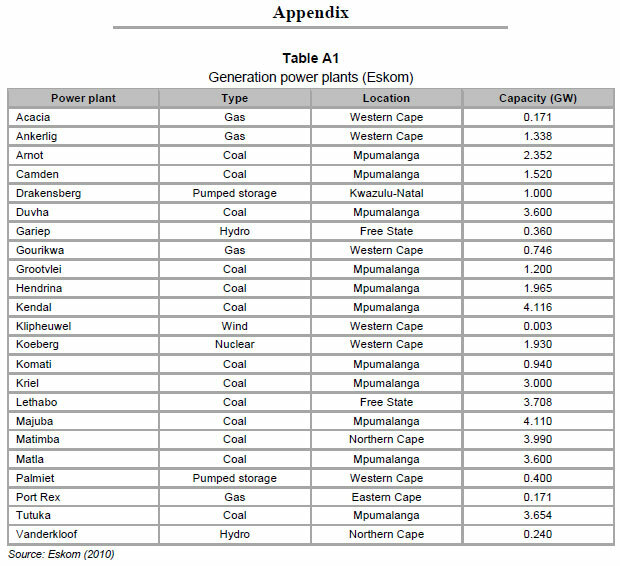 The current installed capacity per existing power plant is presented in Table A1 in the Appendix, showing that the maximum electricity generated cannot be exceeded in the short term. For the next five years (until 2013), Eskom plans to be building new power plants in order to cover the difference between demand and supply of electricity (DME, 2010b), focusing more on the long-term increase of the supply. The new build programme includes four new power plants (Kusile, 4,800MW; Medupi, 4,800 MW; Ingula, 1,332 MW; Sere windfarm, 100MW) that will boost the electricity supply to the country. A new project has also been launched in Botswana, a coal-fired power plant with a capacity of up to 4,800 MW. Moreover, it is also necessary to upgrade the older plants, hence the electricity entity's intermediate plans, known as the Simunye projects. However, this rise in electricity supply will be in effect only by 2013 or later, so the maximum supply in the short term will remain constant. In stark contrast to the electricity supply figures, electricity consumption has increased substantially over the past decade: 11.96% between 1995 and 2000, and 34.58% between 2000 and 2006. The growth in demand in this latter period is particularly important, given that it coincides with a period of no supply expansion, as noted above. 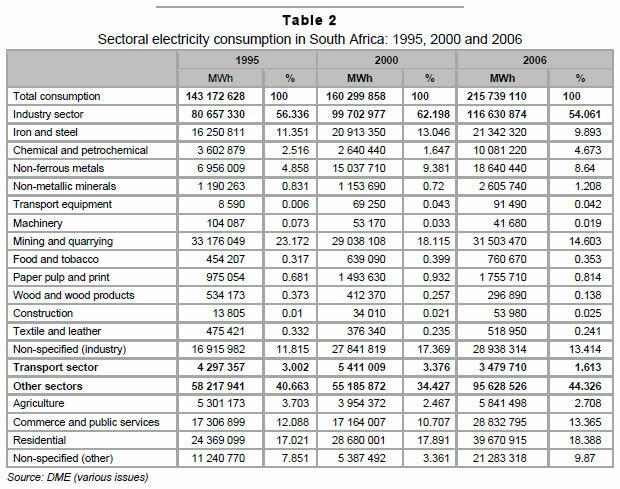 A sectoral analysis (Table 2) shows that the industrial sector has always been the largest consumer of electricity. The industrial subsectors that have shown the strongest growth over the years are 'chemical and petrochemical' and 'non-metallic minerals'. The 'construction' sector, although not a big consumer in its own right, has almost doubled its electricity consumption over the period, an indication of the growth in the sector during the 2000s. In addition, the 'non-ferrous metals' sector also doubled its contribution to the country's electricity consumption within the studied period. The residential sector's electricity consumption has also increased, while keeping its share in total consumption fairly constant at about 17%. Moreover, the residential sector was the single largest individual consumer of electricity in 2006. The electricity consumption of 'commerce and public services' increased in 2006. In comparison with other sectors, the 'commerce and public services share remained in the range of 10-13%. From the above statistics it is evident that the country has undergone major economic structural changes, depicted by the changes in the electricity consumption profile. One plausible reason is the economic and social changes that the country has undergone since 1994. Literature abounds with information describing South Africa's electricity prices (Doppegieter et al., 1999; Van Heerden et al., 2008). It has been noted that South Africa has had low and declining real prices of electricity for a prolonged period of time. These can be seen in Table A2 in the Appendix, which presents the average real electricity prices in selected sectors for the period 1993-2008 and their year-on-year percentage changes. 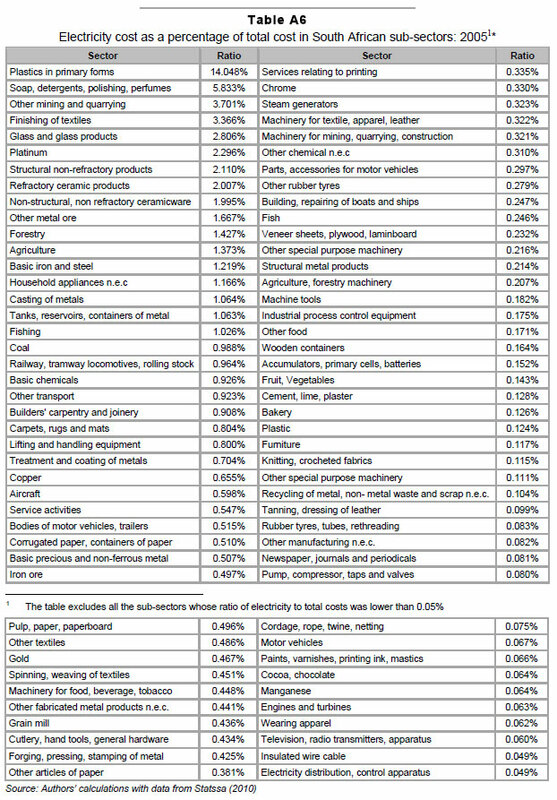 For a more detailed picture of electricity consumption, its prices and the economic output per sector, Figure 1 presents a summary of graphs for the 'industrial', 'mining', 'transport', 'agriculture' and 'commercial' sectors for the period 19932006. From this it is obvious that not all the sectors behaved in the same way during the study period as far as their electricity consumption was concerned. From the industrial sector's graphs, it can be observed that electricity consumption showed a positive relatedness with the sector's economic output, while this was negative for the electricity real prices, which were decreasing throughout the study period. Next, the mining sector's electricity consumption appears unaffected by both its output and the electricity prices. The consumption experienced a sharp decline at the end of the 1990s, picking up during the 2000s. The mining sector's output increased substantially at the beginning of the 2000s, following the internationalisation of the economy and the end of the sanctions. On the other hand, the real electricity prices for mining steadily decreased until 2002. The transport sector presents a similar example, with electricity consumption that fluctuated over the years, with an average increasing trend but severe decline in the last years of the sample. Its economic output has been increasing continually over the studied period, while its electricity prices started increasing again only after a period of critical decline from 1993 to 2002. The electricity consumption of the agricultural sector presents high increases (during 1993-94 and 2001-2003). A structural change is seen during 1999-2000, with consumption decreasing by 31%. On the contrary, its output showed a steady increase over the years, while the electricity prices followed the economy's price overall trend, decreasing until 2002-2003 and slowly rising after that. Finally, the commercial sector's electricity usage showed an upward trend over the whole period, with the exception of 1997. The picture for its real economic output was exactly the same; however, its price fluctuated, with a decreasing overall trend for half the years of the studied period and it has been more or less stable since 2001. Considering this analysis, and according to economic theory, there are two ways of dealing with electricity consumption: a) from the supply side, as an input to the output of a sector, or b) from the consumers' side, as a result of output and prices. 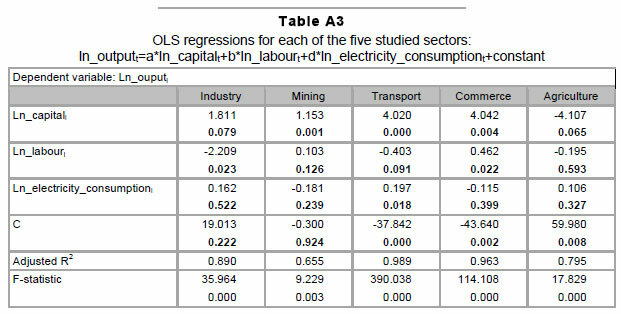 Figure 1 shows that output and electricity consumption have similar trends, so we ran Ordinary-least squares (OLS) regressions to establish the role of electricity consumption as an input to each sector's output (see Table A3 in the Appendix). From these simple regressions, we can conclude that electricity consumption is not a significant factor in explaining the output trends of the sectors in the specific period 1993-2006. Based on these results, and on the conventional approach discussed in the international literature to looking at the electricity demand, we proceed by examining the electricity demand from the consumers' point of view, using a single equation approach in which the quantity of electricity demanded is a function of electricity prices and the output produced in each sector. Local sources of data were used in applying panel data analysis. Sectoral electricity consumption is derived from the Energy Balances of the Department of Minerals and Energy (DME various issues) and is measured in MWh. For the purpose of the Energy Balances, the economy consists of five sectors (the industrial sector, the commercial, agricultural, residential and transport sectors) disaggregated in 22 industries. The data are collected by the Trade and Industry division in Stats SA in collaboration with the Department of Energy, using a questionnaire via post or fax. The main source of information is Eskom, followed by municipal power stations and other industries (sugar, paper, petroleum and mining). The process of supplying the data is under an agreement for confidentiality. The DME does not conduct any independent surveys, nor does it perform regular data audits. The DME relies on the data providers and the reports released by Eskom and the National Energy Regulator (NERSA). In an effort to verify the data, the DME has a quality control process in place involving a manual data check comparing the current data with datasets from previous years, querying when inconsistencies are observed. Following this, the data is subject to review by various committees and key energy specialists. After the initial peer-review process, the data is released to a number of international organisations, such as the International Energy Agency, the South African Development Community (SADC), academic institutions, government departments and other stakeholders (StatsSA, 2009). Following the approval of the data by these institutions, the data is released to the public. While it can be assumed that the data is not perfect, it is currently the best available and it should be noted that the data did undergo considerable scrutiny. The series on the sectoral electricity prices can be obtained from the Energy Price Report, 2009 (DME, 2010), which is not always released annually on account of certain limitations. In this publication, tariffs for various types of energy in South Africa are presented, inter alia, with electricity. 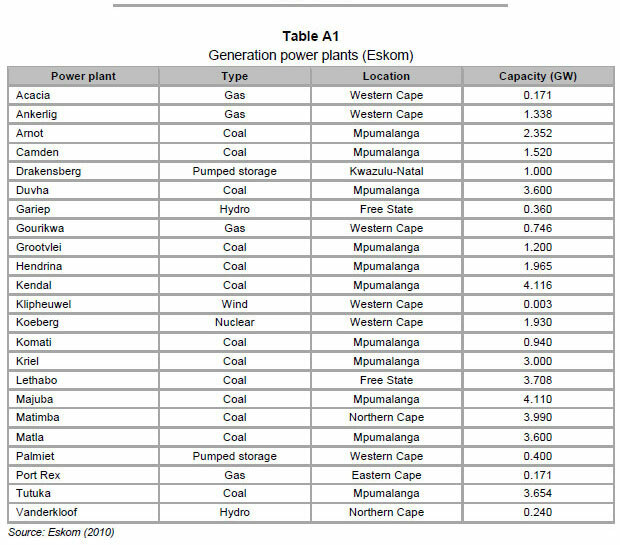 The tables for the electricity charges are derived from Eskom's Statistical Yearbooks and Annual reports. More specifically, the electricity prices are presented as sectoral averages and they represent Eskom's revenue per kWh (selling price of electricity, VAT excluded) by customer category: Bulk, Domestic and Street Lighting, Commercial, Industrial, Mining, Rural/Farming, Traction and International. 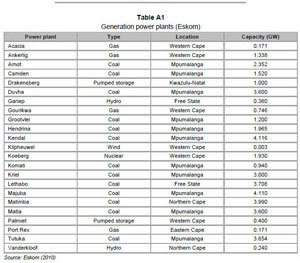 The data are applicable only to Eskom charges to the categories and exclude sales by local authorities. The prices are presented in nominal terms and were converted to real prices by using the annual Consumer Price Index (CPI), with 2005 as the base year, from Statistics South Africa (Statssa). A frequently-asked question in energy economics is whether there is a connection between energy consumption and total income. By employing panel data methods, Sadorsky (2009) focused on renewable energy and supported the hypothesis that increases in real per capita income have a significant impact on per capita renewable energy consumption. This result is confirmed by Apergis and Payne (2010), who examined the existence of interaction between renewable energy consumption and economic growth in a panel data context. Six countries in Central America were studied for the period 1980 to 2006. Their results show that, in the long run, a 1% rise in per capita income increases the renewable energy consumption by 3.5%. In addition, the price elasticity of renewable energy consumption was approximately -0.7. Where αi is the unobserved individual effect and uit is the error term. For an investigation of the effects of prices and industrial output on electricity consumption in different economic sectors, a balanced panel data of five production sectors for the period 1993-2006 was developed. The electricity consumption is thus assumed to be a function of changes in electricity prices and output. It should be noted here that the prices are exogenously determined by the national supplier of electricity, Eskom, so they are not determined by the interaction of supply and demand but by policy decisions. Consequently, and combined with the fact that electricity supply in the country has a specified ceiling (see Section 3.1), the electricity supply is not considered to be a factor affecting electricity demand. where cons is the electricity consumption, price is the price of electricity and output is the total output of the sector i at time t. The letters Ln in front of the variable notate that all the variables are in their natural logs. Linearising the variables will also be useful in estimating elasticities that are defined as ratios of percentage changes. The univariate characteristics of the variables were tested according to the unit root test proposed by Levin, Lin and Chu (2002). The null hypothesis of the test is that each individual time series contains a unit root, as opposed to the alternative that each time series is stationary. The results of the test are presented in Table 4 in the Appendix. 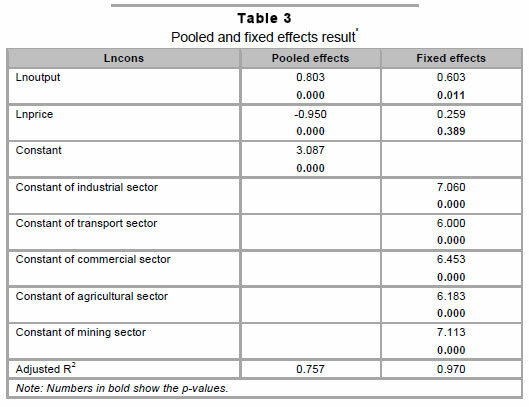 The results of the pooled and fixed effects are presented in Table 3. The pooled effects model is considered to be limited for a number of applications, as it does not take into account any cross-section heterogeneity among the sectors. The fixed effects model, on the other hand, does allow for cross-section heterogeneity and assumes a different intercept for each sector. The results show that both electricity price and output for the industries are significant factors in electricity demand in its entirety. Output has a positive impact, while an increase in price leads to a decrease in the use of electricity. However, when the effects of the different sectors (fixed effects model) are taken into account, the coefficient of electricity prices becomes insignificant, while output becomes less significant. The results of the fixed effects analysis show that cross-section heterogeneity might be the cause of the insignificance of the electricity prices, because in the fixed effects model we allow for sectoral differences, and the price became insignificant. Next, an SUR model is estimated to capture the importance of electricity prices in each of the sectors separately, knowing that the sample is characterised by heterogeneity in their behaviour towards electricity use (see Table 4). The coefficients of the variable Lnprice are considered to be the price elasticities of electricity demand for each of the sectors. The results are in accordance with expectations following a careful study of Figure 1. The industrial sector has inelastic electricity demand (elasticity = -0.869) for the period 1993-2006. The price does not play a significant role in the demand for electricity for the rest of the sectors (their coefficients are all highly insignificant). In contrast, sectoral output is found to be a significant factor that influences electricity consumption for only the industrial and commercial sectors. However, the output of the other three sectors does not significantly affect the electricity consumption. Some of the plausible reasons for this behaviour are discussed below. The results of the analysis above suggest that the relation between electricity consumption and electricity prices differ from sector to sector. The price elasticity in the industrial sector is highly significant and negative. In contrast, the rest of the sectors present insignificant price elasticities. Before we turn to discussing the results of the main focus of this study, it is equally important to talk about the findings relating to whether or not the output affected the electricity consumption of the various economic sectors. Economic output was a positive contributing factor to only two out of five of the sectors studied: industrial and commercial; regarding the other three sectors, the output did not play a statistically significant role in their electricity usage. First, the agricultural sector in South Africa is relatively labour-intensive, and still uses traditional methods of production. Hence, the output should not be expected to relate to the electricity consumption by the sector. Regarding the transport sector, one of its main electricity users during the early part of the study period was freight rail. This sector all but collapsed during the study period when freight transport was shifted to road and long-haul. 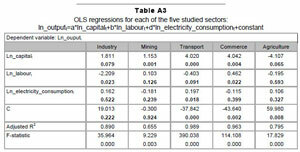 This implies that the electricity consumption for the sector declined significantly, but the output/production did not. This suggests that the South African transport sector experienced a switch from electricity to other forms of energy, such as oil/petroleum. Finally, during the period under investigation, the mining sector engaged in a process of co-generation whereby the mines started generating their own electricity or creating smaller power units. Consequently, their electricity demand from the national supplier has declined. The level of the electricity prices is historically very low, which has also a caused a lack of behavioural response to price changes, as Blignaut and De Wet (2001) point out. 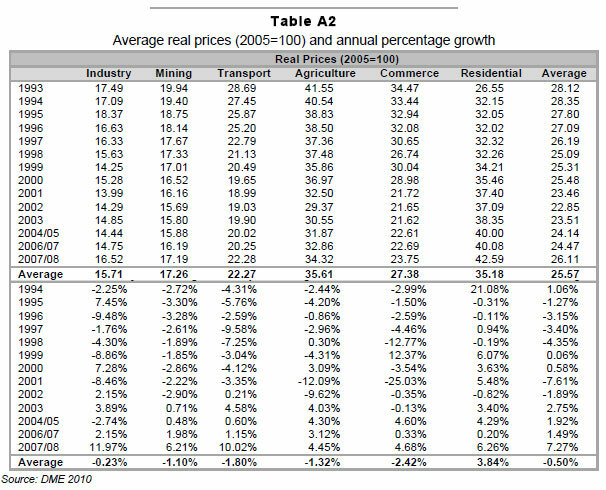 Moreover, the real prices in a number of sectors declined significantly until 2002, when the price reform began to take effect. There was a long period during which consumption increased more rapidly than prices, owing to other factors, such as product demand or technological change. This is not uncommon. Miketa (2001) found similar results when studying various countries, and attributed this lack of behavioural response to the fact that energy prices were not constructed to be industry-specific. The low level and declining trend of electricity prices in South Africa have also contributed to the cost of electricity as a significantly low percentage of the total cost. Blignaut and De Wet (2001) have shown that, for a number of years, from 1976 to 1996, the ratio of electricity to total costs was less than 10% for the majority of the South African economic sectors. 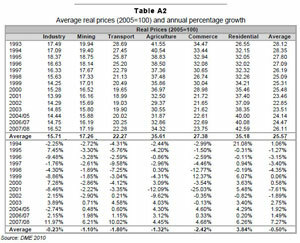 Table A6 in the Appendix confirms this for the year 2005. The low proportion of electricity costs, showing the low relative importance of the specific product to the consumers' budget, makes one expect low (or even insignificant) price elasticities. The price policies followed in the country, in addition to the results of the above analysis on electricity, resulted in an enhancement of electricity consumption as reflected by a lack of price sensitivity in all but the industrial sector. Moreover, the stronger the demand for electricity, given the electricity supply mix, which is heavily dominated by coal, the stronger the demand for power. To address the mismatch between electricity supply and demand, such as the one South Africa is currently experiencing, one must understand, inter alia, the underlying behavioural responses due to changes in price. The sector-specific approach employed here highlights each sector's reaction to price changes before the recently-proposed increases. Using panel data, this study examined the price effect on electricity consumption by sector and the respective price elasticities were estimated. The findings of the analysis point to ambiguous results and even 'abnormal' behaviour towards price changes in all but the industrial sector, which is the only one in which consumption declined with price increases and vice versa. According to this analysis, the lack of behavioural responses to price changes contributed to the insecure and uncertain environment in which the current policymakers find themselves. More disconcerting, however, is that the lack of sensitivity to price changes has also acted as a strong stimulus for the growth in CO2-emssions. If South Africa wishes to curb the emissions of CO2 from electricity generation it will do well to induce change that would enhance a behavioural response to price changes. This would include both efficiency improvements and technological changes. In the future, a structural change is expected due to the high increases in the electricity tariffs. The past insensitivity to price changes might disappear, with different sectors turning to more efficient technologies and other, more affordable, forms of energy. * Both specifications' results are after correction for the serial correlation and heteroskedasticity present. Whiteheteroskedasticity-consistent standard errors and covariances were used to correct for heteroskedasticity, as well as the Prais-Winston transformation to correct for serial correlation, as proposed by Baltagi (2008). In addition, the Hausman test concluded that there is no misspecification in the model. For the results of all the tests, see Appendix Table A5. The authors would like to thank the anonymous referees and the editor of SAJEMS for their valuable comments and suggestions. Also, Dr Inglesi-Lotz would like to thank the South African National Energy Research Institute (SANERI) for their financial support.